A Search for Meaning - The Novelist. 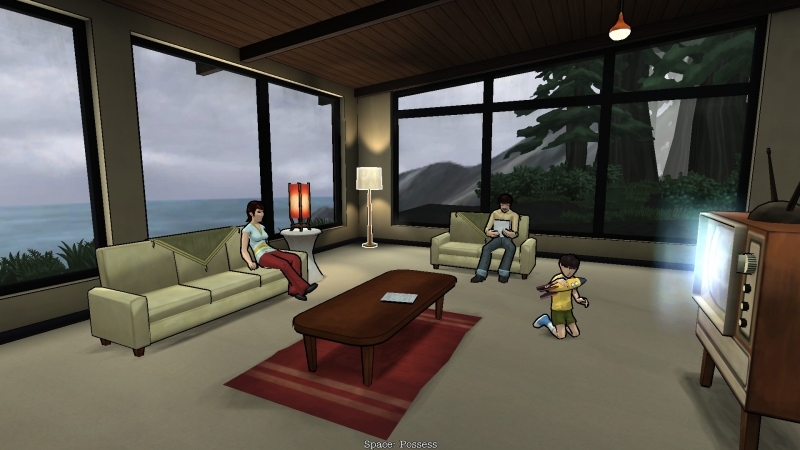 The Novelist, by solo developer Kent Hudson, tells the story of the Kaplan family, and their stay in a holiday home over the summer. Patriarch Dan, a novelist of some repute, has been struggling to push through writers block and get his latest novel written in a timely fashion, and the attendant pressure that comes from having his agent expecting actual work to be done. Meanwhile, Dan and his wife, Linda, have been growing further and further apart, and both of them are wanting to re-engage with each other and save their struggling marriage, if only for the sake of their son Tommy. Tommy, aged 5, has problems of his own, feeling distanced somewhat from his father, and struggling with both making friends and not progressing academically the way everyone else seems to be. You take on the role of a spectre living within the house, who feels compelled to meddle - behind the scenes - in the lives of those staying at the house, uncovering their desires and helping them to work through their issues. In game, this translates to you moving through the house, looking at the notes, drawings, letters and journal entries written by the resident mortals living there; as well as lightly scouring their memories to glimpse at key points from the past few days, in an effort to uncover what each of them want out of each of the nine major events (or chapters) that make up their stay in your realm. You then make the choice as to which of them is going to get what they want for that chapter, who will miss out, and who will receive a 'compromise' - not quite what they wanted, but better than nothing - and whisper it in the ear of Dan as he sleeps. As you read and explore the lives of the Kaplans a story emerges behind you, and the choices you make inform the story as it unfolds before you. Family breakdown or a chance to do better? There is a stealth mode that makes you visible to the Kaplans, and thus forces you to be more cautious about your movements, but all it serves to do is detract from the game's true strength - the unfolding story of the Kaplans and their stay within the house. Getting seen by any one member of the family more than once in a chapter causes that person's choice to become unavailable for that chapter, which essentially negates the point of exploring more of their side of that chapter’s arc, and cuts you off from experiencing the best possible resolution for that character. My own experience with The Novelist was broader. I've never experienced life's issues in a similar way to Bobfish, or to Dan, but I have experienced bits and pieces. As a writer, I know what it's like to sit in front of a screen and wish that the words would start flowing the way they did yesterday, and how difficult it is to try and force sentences together in order to meet a deadline. As someone who has been married less than a year, I know how inviting another person to share your life throws out the delicate balance between work and leisure you've been working with for years, and how scary it is to come to the realization that there is someone else relying on you for things now; how difficult it can get to reconcile each other’s dreams for the future into something that both of you are happy with. As someone who was not that long ago a child living under his parents roof, I know the pain of feeling like you're being neglected because Mum and Dad have too many 'grown up' things that need to be done, and how difficult it is to try and engage with them in order to get the love and support you need. With that foundation, it's impossible not to come out of The Novelist without having been deeply affected by the messages it has to deliver through the experience, and there are many messages to be gleaned from this one. Good for one, but how do the others feel? 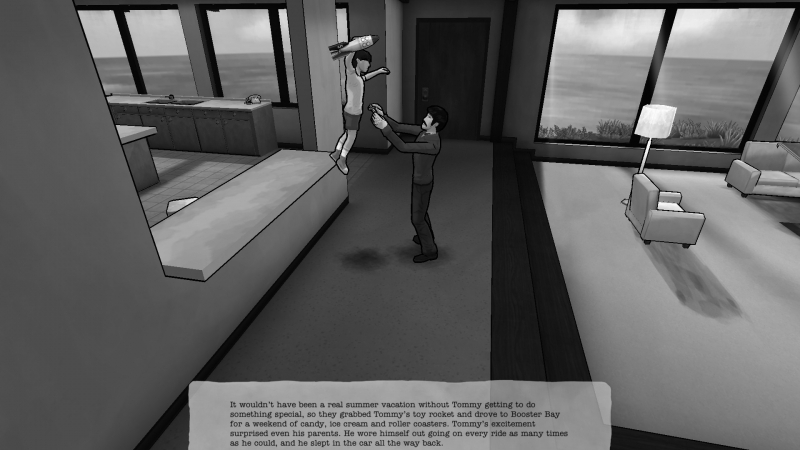 Obviously, The Novelist is a game about balancing work and family and there are many ways to try and achieve a balance throughout the unfolding story. Would you sacrifice a major career opportunity to attend the funeral of your wife’s beloved grandmother? Is taking a few hours out of your day to play with your child going to completely ruin your novel? Would you sacrifice dinner with your family every night to down a couple of glasses of bourbon and chain yourself to the keyboard for a few extra hours? The dynamics of having three characters, each with their own desires and goals, makes this all the harder. No matter what choice you make, at least one person will end up unhappy, and in some cases, all three will end up feeling worse about themselves than they did before. The question becomes: how much of a balance can you strike to ensure that you and your family maintain a healthy relationship with each other, while still running after your dreams, whatever they may be? If one has to be sacrificed to pursue the other, what is the correct choice? 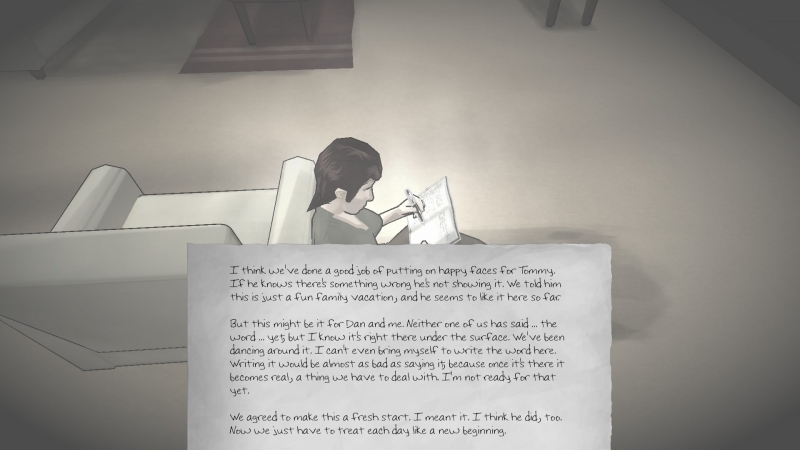 The developer’s own opinions on that question shine through quite clearly, as completely ignoring either member of your family results in an early conclusion of the game, as Linda leaves with Tommy, either because she cannot stand being in a house with a husband who will not show interest in her, or because she cannot stand to see Tommy abused by Dan’s neglect anymore. This begins a special chapter, with only a single note to read from Linda; telling Dan that the final straw has been reached, and - even though it’s too late to make things right again - he needs to decide whether his book is worth losing everything else he spent the last 5-10 years building with his family. But there’s another level here: realising that everyone wants to achieve something in their lives, no matter how old they are, and that, in the family unit, everyone needs to accept this and help the people they care about work towards their own dreams as well. A few of the choices, to say nothing of the character endings, reflect this quite well. Linda used to be a full time painter before Tommy was born, and has taken it up again recently. Several of her chapter goals include putting on an art show in the local gallery, and joining up with an artist’s co-op. Will you sacrifice Linda’s dreams of becoming a notable artist in order to focus on giving Dan’s novel some extra polish and advertising? Tommy has had trouble with basic literacy, and obviously identifies Dan as an expert in that area of life, and thus someone whose approval he seeks; as well as having trouble making friends at school. He has a book of exercises designed to make sure he can ‘catch up’ with the rest of his peer group, and many opportunities to meet other kids and develop some self-confidence. Will you ensure that Tommy feels loved, and like he can succeed at whatever he puts his mind to; or will the pressures of the publisher, or the pressure to support Linda, push Tommy’s needs further and further to the sidelines? In their best endings, Linda becomes involved with the local art community, helping others learn to make art, and having a modest success with selling her own works. Tommy makes his way through life as a happy and well-adjusted person, before going on to become a world renowned comic book author and artist. Dan and Linda’s marriage becomes one where they only wind up closer at the end of each day. At their worst, Linda leaves Dan entirely (or for an only slightly better ending, stays with him in a loveless and unfaithful relationship that has everyone talking about them behind their backs) and goes her own way, while Tommy ends up with few friends, and completely unable to function properly in the adult world. Dan can either end up becoming one of the most important authors of the era, or leave his book unfinished and drift from job to job in an effort to support his family, to something in between. It is possible - like in real life - to help everyone get a decently satisfying ending to their stories, but it is one of the most difficult things you can do. There is a lot more that can be said about The Novelist, so many more questions it raises. But at my core I want to encourage people to have these experiences for themselves, ask themselves the questions, and discover something about themselves. What I can say is that The Novelist will sit you down and make you think long and hard about the choices that you make, both in the game, and in the real world. I learnt that I would never sacrifice my family, small though it is at this moment, and that I would probably give up on some of my own dreams if it meant giving them a chance to achieve their own; even if I don’t want to be in, and I pray that life never presents me with, a situation where that is a very possible outcome. What will you take away from it? And, even though Dan could be anything, being a Novelist is most often associated with working from home - no set office to travel to every day, etc. It makes the point that, even when you're there, you can still not be there in the ways that your family want/need you to be. @Bobfish: Definitely, I'm not the same person that I was at this time last year. Much of that has been due to sharing my life with someone on a full time basis. My question though...have your perspectives changed since you entered into Wedlock?